alaTest ha recogido y analizado 10 comentarios relacionados al producto Steiner Safari Ultrasharp Binoculars. En promedio, la calificación para este producto es 4.7/5, al ser comparado con la calificación 4.3/5 de otros productos en la categoria Binoculares. Analizamos las valoraciones de los usuarios y los expertos, la edad del producto y demás factores. Comparado con otros Binoculares el Steiner Safari Ultrasharp Binoculars recibe una alaScore™ global de 88/100 = calidad muy buena. Small and lightweight. Very clear viewing makes it perfect for people with small hands or someone who wants a handy set to take on holiday or days out. I bought these for my husband for Christmas, and am pleased to say he was delighted with them. They are exactly as described giving very sharp vision and come with a handy pouch for easy packing / storage. They are also very light and tactile to hold. Superb binocular, shame about the case. These binocs are excellent value. A clear sharp image in a light and easy to adjust body. The moon has never looked so good. Wanted compact binoculars for taking on holiday. Build quality and optics are excellent. 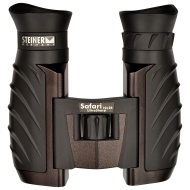 I am delighted with the Steiner Safari Binoculars and can highly recommend them.